Relatively new fern that excites us. 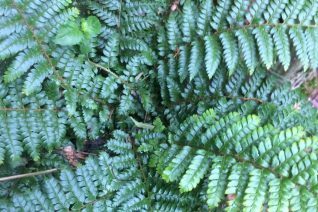 Asian Saber Fern ( doesn’t that sound lovely- a little Klingon in the Dryopteraceae). Evergreen fern with really pretty glossy intricately serrated fronds. To 2′ x 2′ for part shade to shade in rich, moisture retentive sites. So far its been a vigorous adaptable and really nice looking fern for us. Excellent woodland appearance- in fact it looks good year round. The arctic winter of 2017 left this glossy creature completely unfazed. We like that. Should be invaluable in winter containers. Pest and disease free plant. Highly deer resistant. Spreads to form multiple rosettes. Soft Shield fern is native to Alaska- well points north in general. 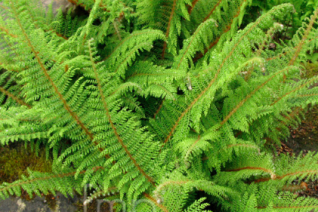 That means its bone hardy to cold but its also a fantastic evergreen fern for dry shade in our region. Finely divided fronds taper to 2′ long. The central stem is a soft furry brown- good contrast. Spreading colony creating fern to 3′ across. It has the unique habit of vivipary. It makes small new plants spontaneously right off the frond. Useful. Good looking appearance year round. Rich, moisture retentive soil with regular water to establish. Incredibly drought adapted when older – as long as its in shade. High deer resistance. May be cut back hard in early spring to refreshen. Grows very quickly. 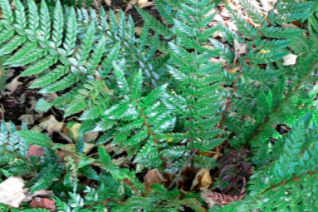 What do you get when you cross a Tasmanian tree fern with a cold hardy European native fern? You get this spectacular evergreen that forms large single rosettes with flaring intricate glossy green leaves. Evergreen and not injured by our coldest winters. To 3′ across eventually in part shade to dense shade. Rich, moisture retentive soil with regular water. Great in borders, among Rhododendrons in containers. Fantastic in winter containers. High deer resistance. Takes dry conditions when very established. 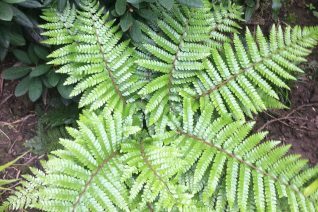 Immensely handsome glossy evergreen fern with intricate large leaves Forms a large rosette up to 2 1/2′ wide and just 14″ tall. Small hairs line the stems and give this fern its specific epithet of blepharum – eyelashes. Known as Eyelash fern for this trait. Full shade to part shade in rich, moisture retentive soil. Regular summer water. Mass as a shady ground cover or bed underneath old established shrubs. Year round good looking with no damage from the hardest winters. Easy. High deer resistance.